Hawker House, Street Feast's winter indoor street food market,is open in Canada Water, just a 5 minute walk from the tube and overground station. Open on Fridays and Saturdays, it's a massive space with six bars and 13 street food traders, inc B.O.B's Lobster, Prawnography, Club Mexicana, Kimchinary and many more, plus DJs and good times. Make sure you visit! "Hawker House - the street food night market in an incredible warehouse space in Canada Water - reopens on 29/30 January after closing for the Christmas break. 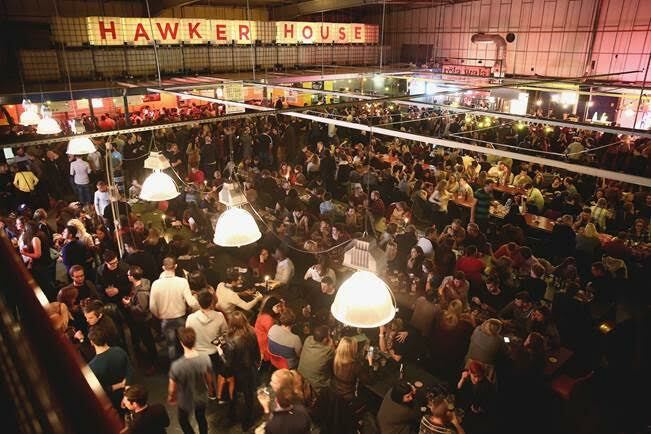 After a hugely successful first season, with 5,000 people through the doors every weekend, Hawker House reopens its doors from Friday 29 January, running every Friday and Saturday till early Spring. 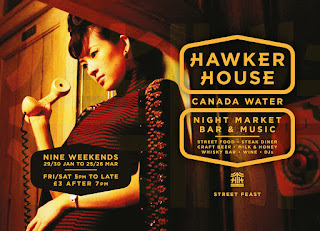 Hawker House relaunches with four brand new traders joining the line-up; Kimchinary, serving Mexi-Korean wraps made for tackling face on, Mother Clucker with their tea brined, buttermilk soaked, twice battered fried chicken, Club Mexicana, serving meat free, magnificent tacos and burritos and Chin Chin Labs, dairy daredevils making nitro-frozen ice cream. If you missed it this time round, look out for The 86 - our hidden bar with four fantastic spirits and 12 brilliant cocktails." Saturday from midday til late. Entry free before 7pm and £3 after.